After a weaker April, many US retailers reported stronger May sales, with a number recording better-than expected results. The value-end of the market posted positive results with Stage Stores and Stein Mart recording notable gains. Stage Stores president and CEO Michael Glazer said that its 8% comparable sales growth for May was the "highest increase for May in the past 10 years". Similarly, Stein Mart interim CEO Jay Stein said that it has been nearly six years since it had a monthly increase greater than this without the addition of a significant promotional event or impact from a calendar shift, reporting a 3.4% increase in sales for the month. Off-price retailer Ross Stores also posted strong gains over the month, up 13% to reach $746m, while Target said its results were at the "high end" of its expected range, as it posted a 5% sales increase to $4.7bn. US retailers, excluding drug stores, recorded a 4% increase in sales during May, according to the International Council of Shopping Centers (ICSC). The numbers are an improvement on the previous month, when retailers booked a 2.4% rise. However, ICSC vice president of research and chief economist Michael Niemira warned that the trend pace of industry sales has "moderated since earlier in the year, and most recently is affected by worry over the European financial situation and its ripple effect on the U.S. stock market and economy". Having the right products in stock was cited as a growth driver for a number of retailers. 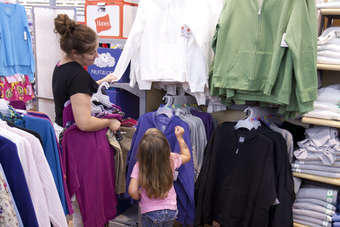 Ross stores vice chairman and CEO Michael Balmuth said: "Our strong sales results in May demonstrate that our ongoing focus on providing exciting assortments of name brand fashions for the family and the home continues to resonate with today's value-oriented consumers." Meanwhile, Gap Inc chairman and CEO Glenn Murphy said he was "pleased with with overall customer response to summer product in May". However, retailers that didn't have the right stock suffered. Susan McGalla, CEO of The Wet Seal, which recorded an 8.8% decline in comparable store sales, said: "At Wet Seal, down-trending fashion knit tops and screen tee businesses overshadowed growth in several other categories." It now plans to shift its focus towards better performing categories including woven tops, jeans, dresses and shoes, "to better position Wet Seal for the back-to-school season." And, as retailers prepare for the back-to-school shopping season, they will need to continue to "hone their strategies to be able to ensure they are appropriately positioned to take full advantage of it," emphasised Niemira.